We see a daily drumbeat of negative news about the impact of the Affordable Care Act on individuals and the economy — see this report on Friday from Fox News. Rising premiums, loss of full time jobs, bigger deficits, and so much more all tied to ObamaCare. That’s why I was pleased to see Jason Furman, Chair of the White House Council of Economic Advisors, come out with a presentation and report on Friday at the Center for American Progress detailing “The Economic Benefits of the Affordable Care Act.” Like it or not, we have to keep driving home these facts as often as possible because ACA’s opponents still have the advantage with public opinion. 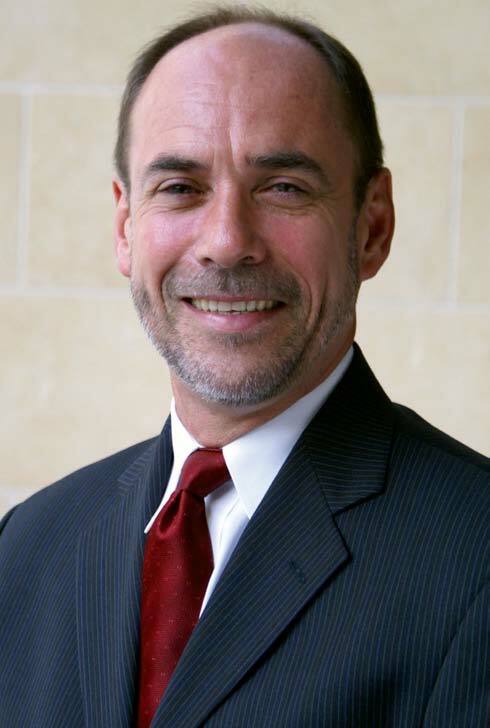 For example, many charges that the ACA would cause economic havoc have been disproven. First, the ACA is not a “job killer” — since the major ACA expansion took effect on January 1 2014, we’ve had the strongest year of private sector job growth, 3.1 million, since 1998. 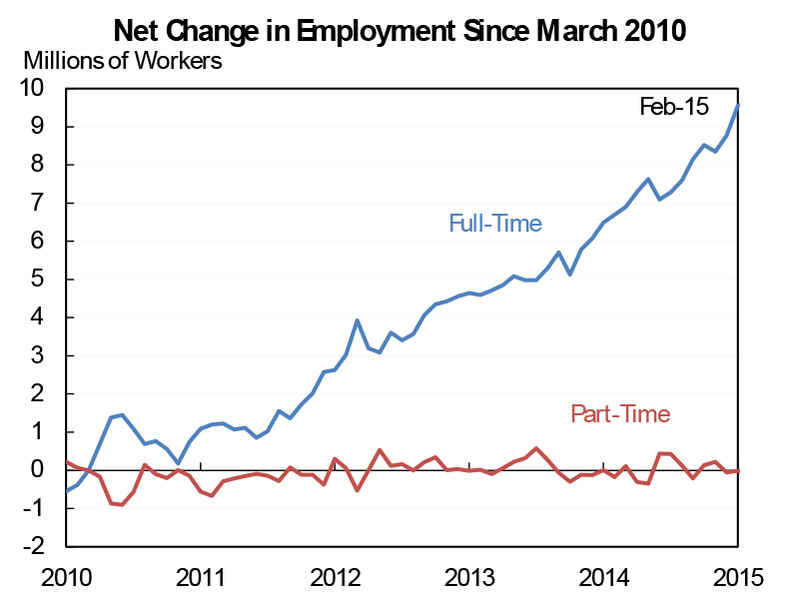 Second, the ACA has not created a “part-time job” economy, with employers pushing workers into part-time work to avoid health insurance responsibilities — see this chart from the CEA. Part time employment has gone slightly down while full-time employment is increasing at the best rate since President Bill Clinton’s tenure. Beyond that, the ACA is eliminating something we all have known and talked about for years called “job lock” — people staying in jobs only because they needed health insurance benefits and would have been uninsurable in the individual market because they had a pre-existing condition. I recall anecdotes over the past 20 years of people getting married just for the health benefits. Those days and those stories are mostly over — and good riddance. 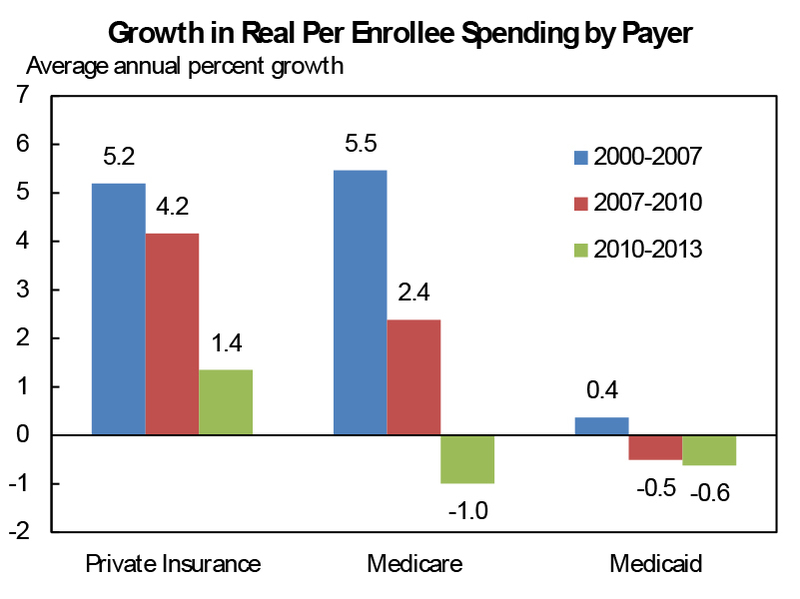 Meanwhile, over the past five years, we are seeing an unpredicted and astonishing decrease in the growth rate of U.S. health care costs, affecting Medicare, Medicaid, and private health insurance. 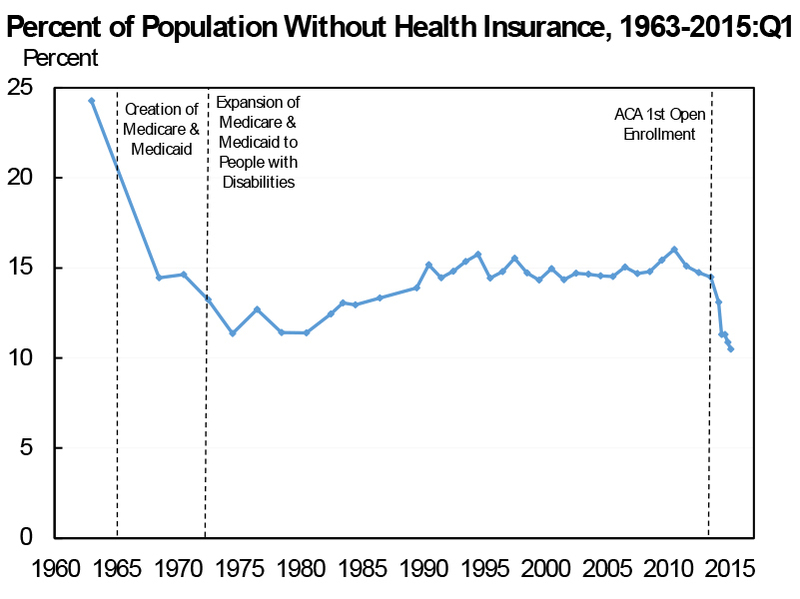 Yes, premiums and other costs are still going up, though by the lowest rates we have seen in 50-plus years. It’s remarkable and the public does not know this at all and believes the reverse. You may remember people used to worry about “Medicare going bankrupt.” What that refers to is the Medicare Hospital Insurance Trust Fund (also called Part A) depleting its resources. Prior to the ACA, it was scheduled to run out of money in 2016 — the ACA reduced spending enough to push back the date of insolvency to 2026 — last year, Medicare’s trustees pushed that date back to 2030 because costs have come in so far below expectations. There is so much more — go look at the report yourself or just this summary from Furman’s White House blog. I’ll just add one more thing. One of the most persistent myths about the ACA is that it is increasing the federal deficit. That’s never been true, and it’s less and less so as the projected costs of the ACA come in far below the 2010 estimates. The Congressional Budget Office projections have been repeatedly downgraded since the law was signed in March 2010, most recently last month. The federal government faces a daunting fiscal outlook, which makes the budgetary impact of the Patient Protection and Affordable Care Act even more important. The official Congressional Budget Office (CBO) analysis indicates modest deficit reduction over the next ten years and beyond. 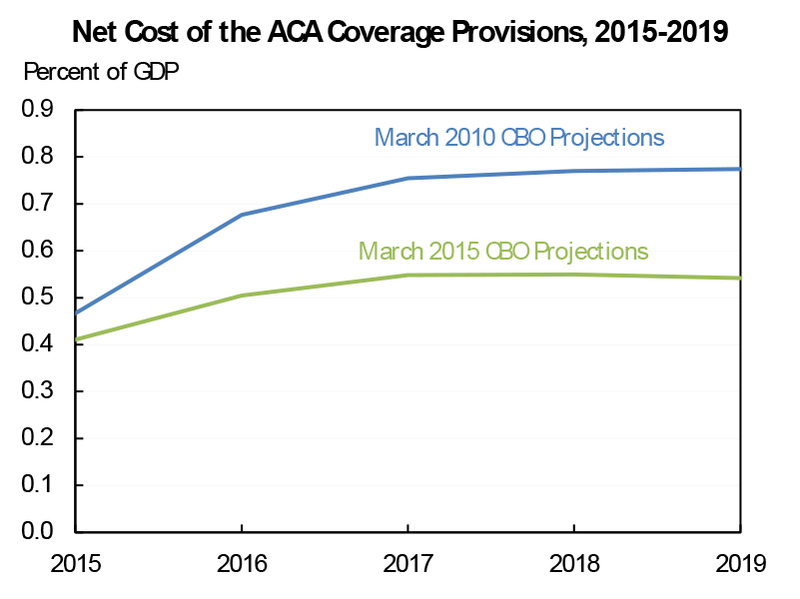 We examine the underpinnings of the CBO’s projection and conclude that it is built on a shaky foundation of omitted costs, premiums shifted from other entitlements, and politically dubious spending cuts and revenue increases. A more comprehensive and realistic projection suggests that the new reform law will raise the deficit by more than $500 billion during the first ten years and by nearly $1.5 trillion in the following decade. I’ve looked and looked to see if Holtz-Eakin ever explained or justified this bogus claim and can find nothing. It’s not just Fox reporters and commentators — it’s full-fledged members of the economics academy pushing the misinformation that gets repeated endlessly. Thanks to Jason Furman and the White House for putting out facts and not fiction. Next Next post: Oh Brother! Those Awful Out-of-Network Charges!